13 states plus military family kids are scheduled to compete at the FootLocker Midwest Regional this year. Looking at last year’s results, Drew Bosley is the only returning Wisconsin runner in the top ten of eligible potential competitors. 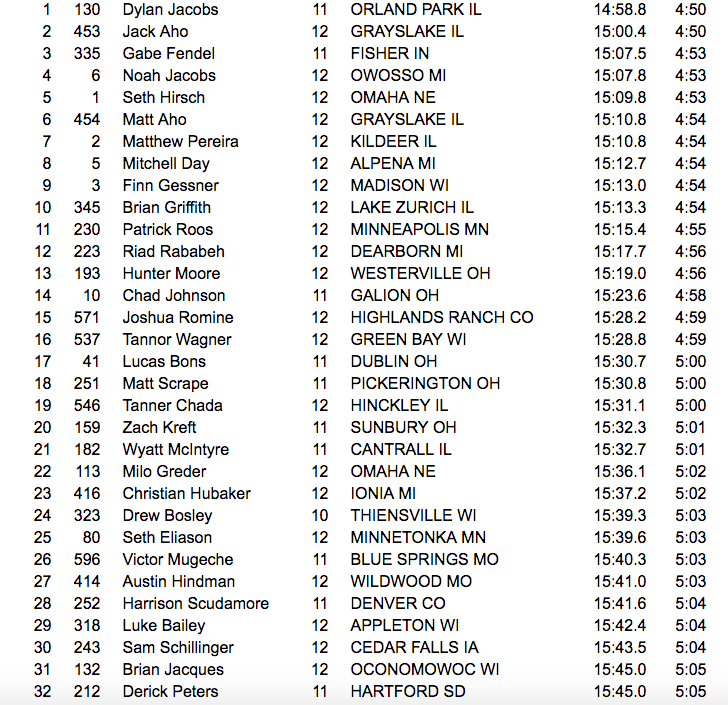 UW Wisconsin recruit, Derick Peters, sits 11th. Wesley Schiek placed 34th last year and sits 12th of potential returners from last year. You have to throw Matt Meinke into the mix of potential qualifiers for this year. He didn’t run FootLocker last year. 1 (4). James Mwaura, senior, Lincoln WA: His 14:48 win at the Washington state meet and subsequent win at NXR Northwest show he has what it takes to win Nike Cross Nationals. 2 (1). Brodey Hasty, senior, Brentwood/unattached TN: Over the weekend he ran 9:08.85 in a HOKA ONE ONE Postal Nationals 3,200 meters on the track. While that may not be a true indication of his fitness, it’s nearing time for Hasty to back up his preseason acclaim. 3 (10). Dustin Horter, senior, Lakota East OH: He tracked down Danny Kilrea in the late stages of NXR Midwest and ran an impressive 14:57.6 on the LaVern Gibson course. 4 (2). Alex Maier, junior, Flower Mound TX: Maier has overcome the illness that knocked him out of the Texas UIL 6A championship race and should be in command this weekend at NXR South. 5 (5). Aidan Troutner, senior, Timpview UT: He is the individual favorite this weekend at NXR Southwest. 6 (6). Danny Kilrea, senior, Lyons Township IL: The Illinois 3A champion showed strength and courage by controlling the race at NXR Midwest and he’s a safe bet to get through Foot Locker Midwest as well. 7 (12). Dalton Hengst, senior, McDonogh School MD: The Maryland and DC Private School champion has had a lot of time to prepare for a run at Foot Locker. 8 (14). Drew Thompson, senior, Fairfield Prep CT: He won the New England High School Championships by 32 seconds. 9 (NR). Conant Smith, junior, Middletown OH: The third-place finisher at NXR Midwest is emerging as one of the top runners in the class of 2019. 10 (3). Dylan Jacobs, senior, Carl Sandburg IL: He’ll have a little something to prove at Foot Locker Midwest, which he won last year. 11 (NR). Devin Hart, junior, Point Pleasant Boro NJ: He won the Group 2 title to stay undefeated in New Jersey with a 15:34 effort at Holmdel Park. 12 (13). Meika Beaudoin-Rousseau, senior, Bellarmine Prep CA: He cruised to the CIF Central Coast Section Division 1 title to remain unbeaten. 13 (11). Mason Gatewood, senior, St. Anthony’s NY: He won the CHSAA title in New York City. 14 (20). Drew Bosley, junior, Homestead WI: His undefeated season now includes a win at NXR Heartland. 15 (23). Nathan Lawler, senior, Pittsford Mendon NY: He won the NYSPHSAA Class B title with the fastest time of the day at Wayne. 16 (9). Derick Peters, senior, West Central SD: He was second at NXR Heartland. 17 (17). Justin Hazell, senior, El Camino Real CA: He should cruise through the CIF L.A. City Section finals. 18 (18). Liam Anderson, junior, Larkspur Redwood CA: He won the MCAL Championships title. 19 (16). Graydon Morris, sophomore, Aledo TX: He won the Texas UIL Class 5A title. 20 (24). Sam Affolder, junior, Loudoun Valley VA: He won the Virginia Class 4A title in 15:20 at Great Meadow. 21 (7). Gabe Fendel, senior, Hamilton Southeastern IN: He had an off day at NXR Midwest but he will be looking to bounce back at Foot Locker Midwest. 22 (19). Michael Phillips, senior, Lawton Chiles FL: He won the Florida Class 3A title with the fastest time of the day (15:14). 23 (NR). Clayton Mendez, senior, Whitney Young IL: He was second in the Class 3A Illinois state final and fifth at NXR Midwest. 24 (21). Grant Gardner, junior, Springville UT: He was second in the Utah 5A state final. 25 (8). Zach Kreft, senior, Buckeye Valley OH: He was sixth at NXR Midwest. 26 (29). Jacob McLeod, senior, Trinity Christian GA: He won the GISA championship. 27 (25). Carter Cheeseman, junior, Forth Worth Christian TX: He has NXR South this weekend. 28 (27). Ryan Raff, senior, Lehi UT: He has NXR Southwest this weekend. 29 (30). Cameron Ponder, senior, Mount Tabor NC: He won the North Carolina Class 3A title. 30 (NR). Silas Derfal, senior, Ithaca NY: He won the NYSPHSAA Class A title last weekend. The scouting report seems to get later every year. They also used to open up the database so that you could peruse every state’s entries. I may write something soon but I think it’s better to just race without knowing your competition so won’t discuss the top guys. Of course it depends who decides to come and who is healthy. I really believe in wisconsin runners so don’t really want to write anything that they can read that intimidates them, so im not going to discuss any of the favorites. All I will say for now is it’s the toughest section in the country if the top athletes decide to travel but all of our studs should be in the race and have a shot at the 2 mile mark to make it happen for them. I will give a teaser about the future to motivate our young athletes in that over this past weekend our west coast entrant Colorado (not sure why they are in the Midwest and if they aren’t this year I apologize) showed they are a better state than usual this year dominating the Nike southwest regional with a team winner over the usually unbeatable Utah schools but more interestingly with 2 young studs qualifying 2nd and third finishing right behind the Utah state champion. These 2 guys are sophomores (Sprout and Allred) and should be around the next 2 years as well (both sub 14:55 at the Nike race. Allred is quite the character as a motivational speaker and author which at that age is wild. I can’t imagine a sophomore kicking with our top boys but these may be the top 2 younger guys in the field (their track times were not that impressive and we have fast kickers from our state but of course those were freshman marks so who knows) if they enter foot locker and clearly will be better next year. Anyway I was surprised by the Colorado success (perhaps Utah is just down this year after a long run of being a top 2-3 cross country state in the nation) but regardless it’s always fun to point out the young studs in our region to watch out for over the next few years and they cleary have 2 of them (both sophomores) based on this weekends results and hopefully our juniors (and of course our lone wolf iron shiek senior) protect the house and don’t let any out of state sophomores beat them. Note I picked colorodo because I don’t expect these sophomores to be able to do as well if they fly to wisconsin and race and don’t expect either to make the top 10 despite them being studs as it’s hard to do back to back top races like this with 2 flights in 2 weeks and usually takes a junior or senior to pull a double off so am mentioning these guys more as awesome guys to watch for in the future and perhaps the barometer of youth for our younger athetes who will run the race, as even if these two don’t make top 10 (I don’t think they will), both will be top 20 if they decide to run most likely based on how they did at Nike and if they don’t run well expect them to either next year or the following as these are probably 2 sophomores that will run if healthy similar times to what Bosley and meinke did last year in the 3200 meters and I believe both Bosley and meinke were in the top 5 or top 7 sophomores in the country in the 3200 meters in track.